Bally is a Swiss luxury fashion house, founded as "Bally & Co." in 1851 by Carl Franz Bally (1821–1899) and his brother Fritz. In February 2018, owner JAB Holding Company agreed to sell a majority controlling stake to Chinese materials conglomerate Shandong Ruyi. Bally was founded by Carl Franz Bally and his brother Fritz in the basement of their family home in Schönenwerd in the Canton of Solothurn, Switzerland. The original family business was the manufacture of elastic ribbon. During a business trip to India in 1849, Carl Franz wanted to buy his wife some lace-up booties - the popular shoe of the day. Unable to recall her exact size, he decided to buy twelve pairs in a range of sizes, knowing that one would certainly fit. Upon visiting the Parisian factory where the booties were made, he noticed that each shoe featured buttons with elastic closures similar to the kind his family produced in Switzerland. Inspired by the possibility of creating more jobs and improving the lives of local residents, he decided to expand his business into shoe production. Together with his brother Fritz, Carl Franz employed designers to assist and together, they began producing shoes made entirely by hand in the cellar of his Schönenwerd home. 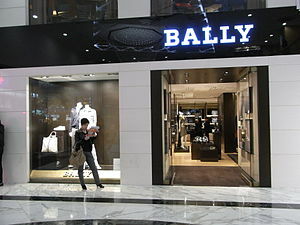 Bally is currently under the leadership of CEO Frédéric de Narp (November,2013), with Pablo Coppola as Design Director (February, 2014) and parent company JAB Holdings at the helm. In 2008 TPG Capital sold Bally International AG to Vienna, Austria-based Labelux Group, a luxury goods holding firm which also owns Jimmy Choo Ltd. and was founded by the German billionaire Reimann family as part of the family’s investment arm Joh A. Benckiser. Headquartered in Caslano, Ticino, Switzerland, the company announced that Frédéric de Narp, a former executive at Harry Winston, would become its chief executive officer in November 2013. In February 2018 owner JAB Holding Company agreed to sell a majority controlling stake to Chinese materials conglomerate Shandong Ruyi. Germany:Berlin, Hamburg, Munich, Ingolstadt and Düsseldorf. Switzerland: Basel, Bern, Geneva, Lausanne, Lucerne, St. Moritz and Zurich. Bally has 11 boutiques in the United States, including: Atlanta, Aventura, Beverly Hills, Costa Mesa, Honolulu, Houston, Las Vegas, McLean, Miami, New York City, and Troy, Michigan. Bally also hosts 3 outlet stores in the United States as well. Bally House in Schönenwerd has been built by architect Karl Moser. As most of the employees of Bally factory were coming from the nearby villages and had a longer working way, it was important for the owners to provide the possibility of healthy food. At first a small cantine was built in 1879, and then in 1915 it was decided to build a bigger building in the middle of the park. Karl Moser has built a two-story classic building that included cantine for the employees, as well as the rooms for the employees, showers and bathrooms. Among the people the house was named Parkhotel. Nowadays the building and the park around is under the protection of canton and is being used for different events. ^ a b Conti, Samantha (10 January 2014). "Frédéric de Narp Talks Bally". WWD. Retrieved 10 January 2014. ^ Conti, Samantha (19 September 2013). "Frédéric de Narp Heading to Bally". WWD. Retrieved 19 September 2013. ^ "GESCHICHTE". BALLYHOUSE (in German). Retrieved 2017-12-31.